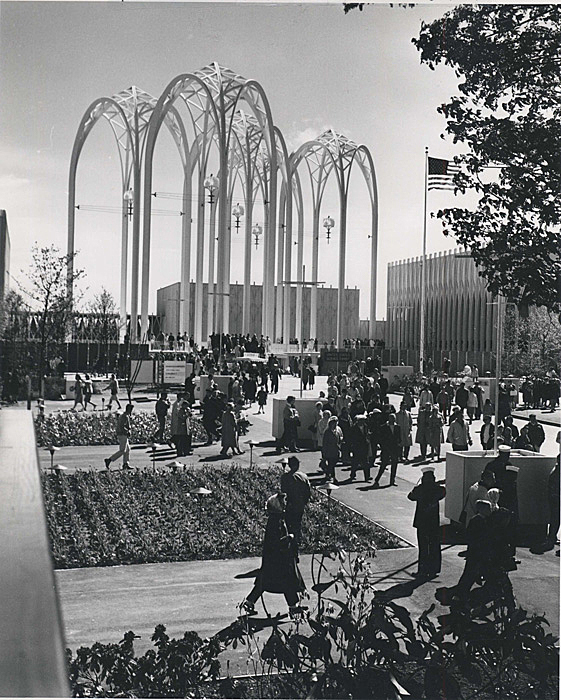 The U.S. Science Pavilion (now the Pacific Science Center) during the Seattle World's Fair in 1962. 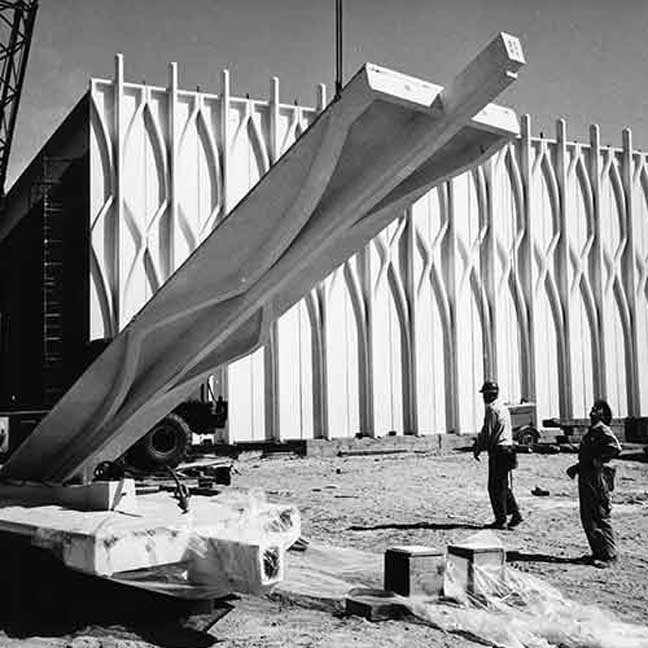 "Blast From The Past: The Fascinating History Of Pacific Science Center’s Architecture,"
One of the pre-cast concrete slabs lifted into place during construction. The six exhibit buildings were designed as windowless, concrete boxes of various sizes. The vertical wall panels, which are all five feet wide and either 32 or 52 feet tall, were precast and pre-stressed offsite by Christiansen. A total of 475 wall panels, equaling 109,000 square feet of wall area, were transported 25 miles to the site where we now stand; incredibly, only one panel was damaged during transit. 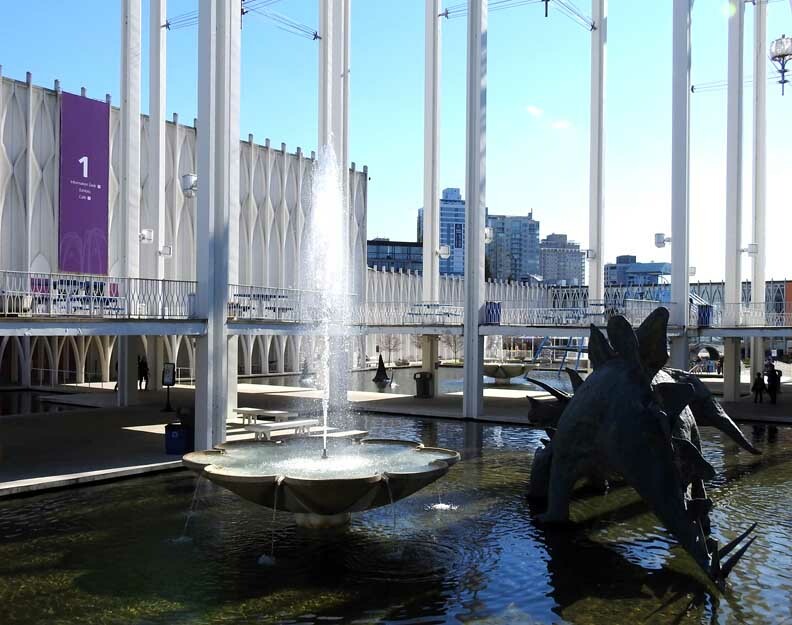 At the time it was constructed, the U.S. Science Pavilion was believed to represent the largest single-use of precast and pre-stressed concrete structural components in the United States. 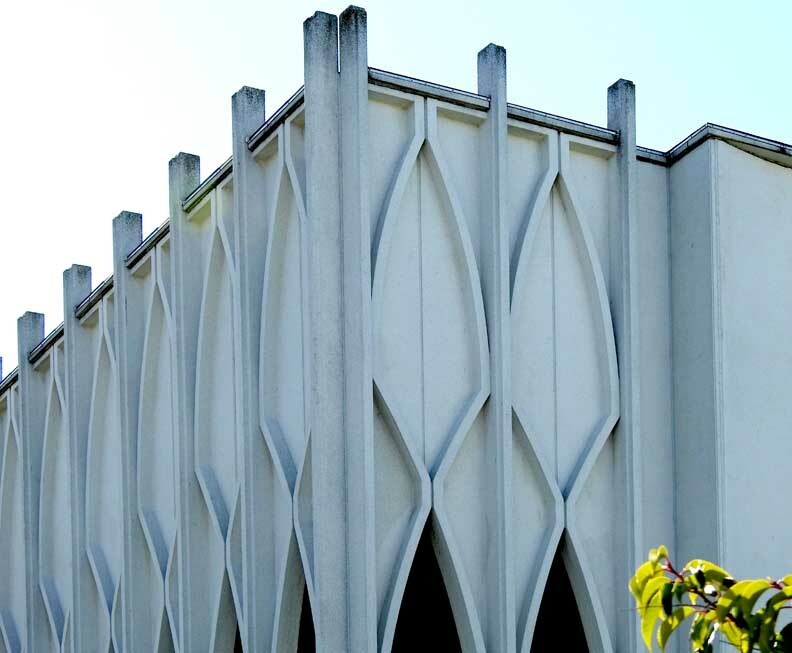 Yamasaki originally planned a single 110-foot tower instead of the now-iconic set of arches. Upon learning of the plans for the Space Needle, he quickly changed his design as not to be dwarfed by the incoming 650-foot structure. 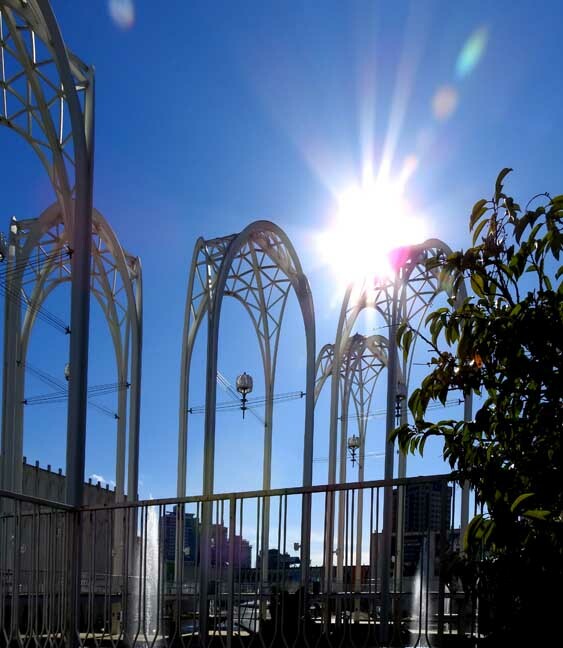 He morphed his plans into five 100-foot illuminated towers topped by graceful, open-ribbed “space gothic” arches. 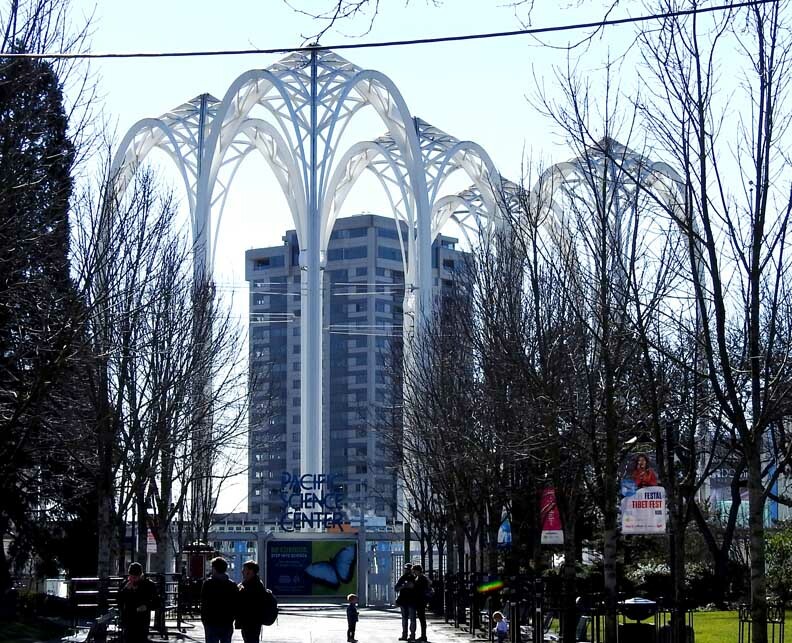 These arches are situated on the primary north-south axis of Seattle Center, and created a visual anchor for fair-goers. In September 1962 following his work on the U.S. Science Pavilion, Yamasaki was selected as lead architect for the World Trade Center. The benches, fountains and flower bowls that reside in our courtyard are all original pieces picked out or designed by Yamasaki himself. 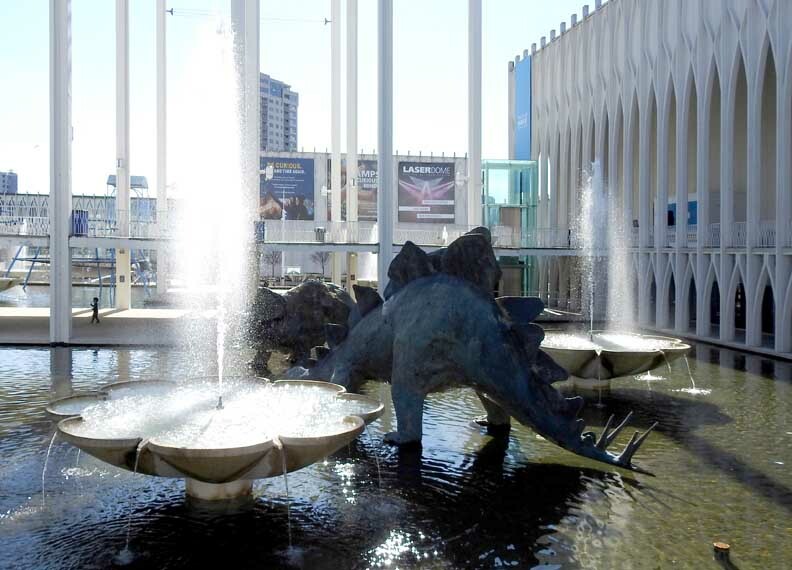 The original ponds, like the rest of the building, were not designed for longevity [for the 1962 Seattle World's Fair]. They were sealed with native cedar, which over time deteriorated and leaked. In 2011 the pools were refurbished and resealed.